The Predator is a boot which has previously set standards and carved a legacy within the footballing world, at the forefront of innovation and tech, it's time for a new chapter with the adidas Predator 19.1 Kids FG Football Boots. This updated classic takes a completely new path, taking influences from the original with brand new and innovative technology. The Predator boots offer creativity, an enhanced first touch and ball manipulation leaving your opponent's second-guessing. The Controlskin upper has been designed to increase control in any conditions, whether it's muddy or dry the ball will stick to the boot providing accuracy and precision. The Sockfit collar also provides a comfortable all in one feeling which connects the boot with the leg for a close to foot feel. 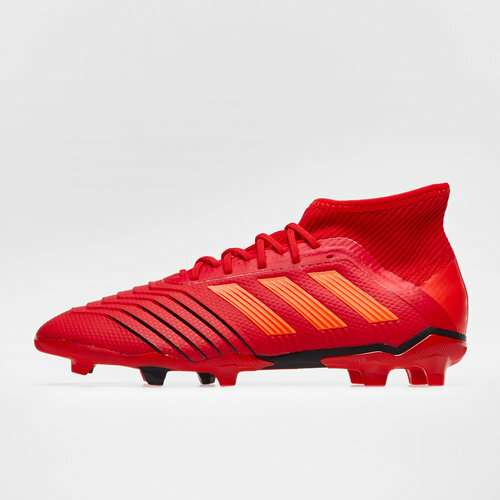 These adidas Predator 18.1 feature an Active Red, Solar Red and Core Black colourway. The Predator is part of the Initiator pack which features a collection of stylish boots that can have most thinking back to some of adidas greatest boots. This pack has been crafted for the influencers of the game. To be a true initiator you have to think differently, you have to be decisive, you have to lead from the front.